Manchester Thunder are top of the Netball Superleague table after recording a third win in 10 days. The Black and Yellows beat Saracens Mavericks 57-49 on Saturday to move above their hosts, level on points with Wasps but with a better goal difference after round 10. Manchester Thunder head coach Karen Greig said: "We knew we were going to feel uncomfortable but we coped with that well not like in previous games. "It was hard work and ultimately they did a great job to come through and take a convincing win in the end." Wasps, who did not play until Monday, lost an entertaining match at Loughborough Lightning 60-59 on Monday. Lightning scored the winning point in the dying seconds to move above Bath to fourth in the league. Team Bath had moved into fourth place after a hard-fought 56-50 win over Celtic Dragons on Saturday. A dogged Dragons refused to allow Bath to run away with the game and were still in it going into the final quarter, before the home side pushed on to secure the win. Bath also welcomed back England international Serena Guthrie from injury for the second half. Surrey Storm avenged the result in the reverse fixture with Strathclyde Sirens in the opening game of the season, winning 53-44 at Surrey Sports Park. South Africa's Shadine Van der Merwe put in a player of the match performance at wing defence to help stifle Sirens' attack. Sirens are now without a win in four matches and remain ninth in the league table. 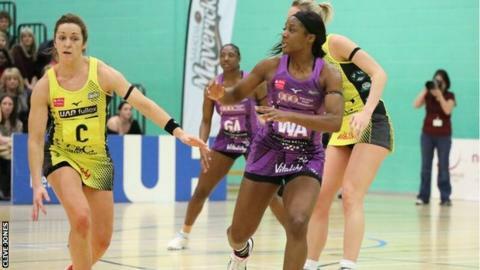 Pulse came close to only their second win in their debut Superleague season but Severn Stars mounted a strong comeback to take their second win in four games, 60-51. Lightning subjected defending champions Wasps to their second defeat in three games with a master class in how to run down the clock, after edging ahead in the closing moments of the game. Wasps led by eight at one stage but Lightning were within six goals and sniffing out a comeback by the end of the third quarter. And Lighnting, buoyed by a raucous partisan crowd, went on to score 20 goals in the fourth period to gain revenge for their 30-goal defeat by Wasps in the opening game of the season. Lightning head coach Sara Bayman said: "It was intense and everyone got the match they deserved. "We had a lot of wrongs to right after that first-round loss. "We had a level of composure that I've not seen before and they had real belief." It was a winning weekend for Northern Ireland captain and Manchester Thunder centre Caroline O'Hanlon, who also plays for Gaelic football team Armagh Ladies FC. The County Armagh-born qualified doctor is used to playing netball one day and then dashing back to her homeland to play for Armagh but Saturday's late start in Bedford meant that was impossible this week. However, Armagh, the team O'Hanlon captains and has played for for 17 years, took the win in the 34-year-old's absence and remain unbeaten in Division 2. And the weekend ended with a Sunday morning netball training session (of course) and then St Patrick's Day celebrations in Belfast. Improving your fitness, make friends and play with or against all ages and genders - netball has it all.